Monday’s ride started out early, meeting B. for the commute to work. Wow, the miles go faster with a friend–I’m making a note of that. B. has done several cross country bike rides, and I asked him my big question: how do you eat enough to sustain day after day of 60-100 miles on the bike? His answer: Waffle House. I made a note of that, too, and then we parted ways, he to the research campus, me to welcome new transfer students at orientation before meeting up with a colleague for coffee. The great thing about a ride that starts at 6:45am is that even after all that, it was only 10am, plenty of time to ride out to Patapsco State Park to get some miles and elevation in. I let my newfangled on-bike GPS device pick the route, and after a steep climb or two, I found myself on Route 40 without a shoulder. And then my sidewalk ran out, and construction started–I got a shoulder filled with debris and ripped-up asphalt. I suppose those conditions are good practice for my upcoming tour, and I found myself walking my bike down the hill, staring at the uphill I’d be riding from a stop. And then I was back on my bike pedaling up and taking a right into Patapsco where I sat on a bench and ate a banana while looking out at the most lovely green hills, and it was all fine, GPS totally forgiven. 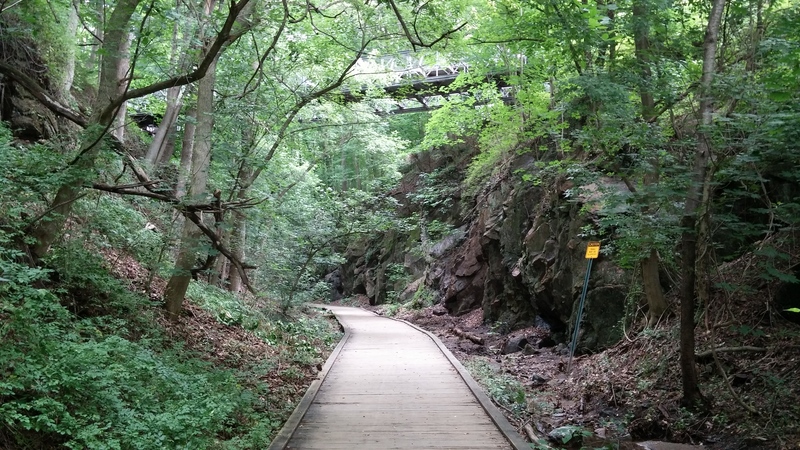 I rode what few roads there were in this part of the park–I could plan better, that’s for sure–and then found myself back on Route 40 on my way to lunch in Ellicott City–no Waffle House, but what can you do. I followed my gut to get home, vague memories of the Trolley Trail with A. a couple summers ago. I snapped this picture near the start of it, grateful for the many folks who have fought to make sure there are places like this to redeem the crummy shoulders that count for bike lanes around here. I took a slow roll home, the Trolley Line to Edmonson Avenue, and then back through campus to my familiar way home, a stop for coffee and a donut on the way. Home again, home again, 2,100 feet of elevation gain in my legs, I’m getting there, I can do this. This entry was posted in personal and tagged Arbutus, Baltimore, Catonsville, Ellicott City, Patapsco State Park, training rides. Bookmark the permalink. You are a rock star, Kate. The tour will be pure pleasure.